China makes a lot of stuff. 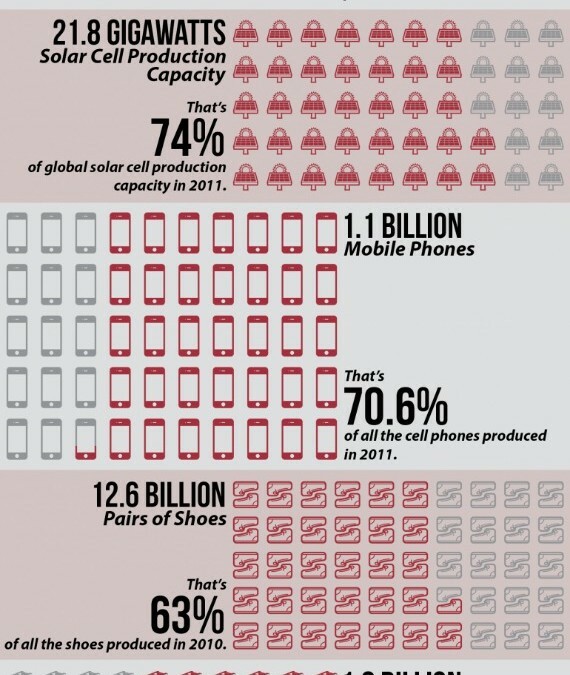 90% of computers, 70% of cell phones, 74% of solar cells for solar panels,… the list goes on. The reason so much stuff is made in China is because it’s cheap. Why is it cheap? Two reasons: Chinese labor is cheap (not much better than slaves in the manufacturing sector), and because the environmental regulations are lax. For instance, it costs $84,500 to make a ton of polysilicon (used in the production of solar panels) in Germany, which has strict environmental laws about the disposal of silicon tetrachloride, a toxic byproduct of polysilicon production. In China, polysilicon is produced for $21,000 to $56,000 a ton. How do they do it? They dump the toxic silicon tetrachloride waste in the fields of villages near the factories. This infographic shows just how much stuff China makes. When you buy something from China, you’re buying a bit of environmental destruction and social injustice. You’re also contributing to climate change, as China consumes over half the world’s coal and a third of the world’s oil to make all this stuff. We here in the United States started the high consumption culture and continue to drive it today. Our stuff is cheap, flimsy and disposable. Our electronics are designed for obsolscence. We don’t fix anything any more, we just buy new stuff. And recycling often means materials end up being sent back to China where it usually ends up in big piles of trash. We here in the United States are showing the rest of the world how to consume… in a very bad way. We’re outsourcing the pollution and the labor so we can have huge amounts of cheap stuff, and costing ourselves a livable planet in the process. * Trashion Fashion, a fashion show with outfits made out of trash, or reused materials. * Infographics: Where Art and Science meet Climate Change, a presentation at the Bainbridge library. Keep an eye on artforclimatechange.org/events for more information about when and where! The Atlantic, Aug 5, 2013.